This has been a busy week for North Korea, as speculation about the health of its leader Kim Jong-un reached a fever pitch until Monday, when he finally reemerged in official North Korean media, with the use of a cane. On Wednesday, North and South Korean military officials held their highest level talks in seven years in the border village of Panmunjom, with Yonhap News reporting Thursday that a North Korea had proposed “exclusive emergency” talks on October 7, in a message from Vice Marshal Hwang Pyong-so. Pyongyang also made a breakthrough last week when two senior level officials acknowledged the North’s “reform through labor” camps for the first time, and affirmed their country’s openness to dialogue on the issue of human rights. Amidst this greater openness to diplomacy, and even acknowledging the international ruckus being caused by Kim’s long absence from the public eye by showing pictures of him after he missed a key public anniversary last Friday, Pyongyang’s relations with Japan have stalled. After what appeared to be a promising restart this summer into the investigation of Japanese citizens abducted by North Korea in the 1970s and 80s, North Korea failed to produce its initial report, which was due by late summer or early fall. After saying that the investigation was just beginning and that only initial findings could be provided, Pyongyang proposed that Japanese officials visit the capital and see for themselves what progress had been made. The abductee issue has seemingly taken a back seat in both international media coverage and North Korea’s attention, giving way to a focus on both Kim Jong-un’s health and high-level talks with South Korean officials. The issue has not fallen off Japan’s radar, however, as the government of Prime Minister Shinzo Abe has developed a healthy degree of skepticism after initial progress and the lifting of some of Japan’s sanctions in early July. On Sunday, just before Kim reemerged, Abe commented on the matter. “We will continue to demand a sincere response for full resolution (of the abduction issue),” he said. “We will use both dialogue and pressure, but dialogue is essential if we want to bring about a resolution.” According to the Jiji Press, Abe is planning to accept Pyongyang’s offer to send officials to look into the investigation; however, he is mindful of the suspicion of the abductees’ families and the LDP’s coalition partner Komeito, and so plans to hold a government meeting to discuss the issue on October 20. Not only the abductees’ families, but also those who were kidnapped are skeptical of North Korea’s sincerity. Hitomi Soga, taken in 1978 but returned to Japan in 2004 with four others after Pyongyang’s initial investigation, did not hold out much optimism given the current state of affairs. She told Kyodo News that “I don’t want the government to (send a delegation) as (the North) has yet to report” officially on the investigation. Additionally, one of Japan’s best hopes for progress with North Korea returned from Pyongyang empty handed on October 7. The head of the General Association of Korean Residents in Japan (Chongryon), Ho Jang-man, spent the previous month in North Korea after Japan loosened restrictions on travel as part of the agreement to begin the abduction investigation. This was the first such visit since 2006, and it was hoped that Ho would be granted an audience with Kim, yet the meeting did not happen. While Ho was supposedly given a letter by a senior government official from Kim, there was no mention of the abduction issue when Ho debriefed his fellow Chongryon members last Friday. There does not appear to be much leverage that Tokyo can bring to bear for the time being, as it still holds out hope that Pyongyang will conduct the investigation. Indeed, North Korea has repeated that the agreement they reached gives them a year to report their findings, although there had been an understanding that the North would issue a preliminary report as well. 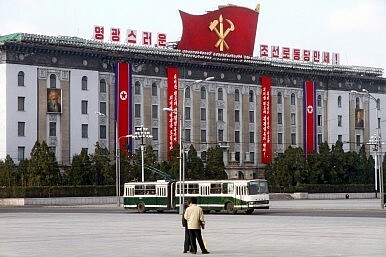 In the lead up to that expected preliminary report, Pyongyang began pushing Japan for a further reduction of sanctions. Tokyo was reluctant, having already dropped some sanctions after the agreement in July was reached. The situation for the time being is relegated to the murky limbo that exists around North Korea’s decision-making process. Pyongyang appeared isolated this summer from everyone except Japan (including China), yet now is taking significant steps to rectify that situation. It could be that Pyongyang feels less inclined to make progress on the abductions now that it is talking to South Korea and other countries through international forums in Europe. While a Japanese delegation to Pyongyang could at least keep the ball rolling on this issue, North Korea does not appear as intent on working to reduce Japanese sanctions as it did three months ago. Pyongyang’s attempts at leverage could leave it out in the cold.